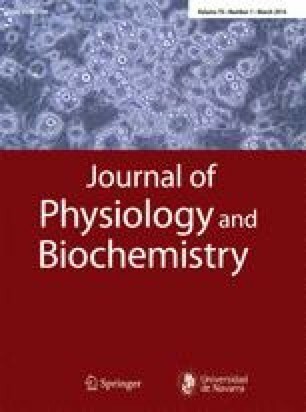 It is a well-established fact that exercise increases pro-oxidants and favors oxidative stress; however, this phenomenon has been poorly studied in human lungs. Pro-oxidative generation (H2O2, NO2 −), lipid peroxidation markers (MDA), and inflammation (pH) in exhaled breath condensate (EBC) have been determined through data from 10 active subjects who ran 10 km; samples were obtained immediately before, at 20, and at 80 min post-exertion. In EBC, the concentration of H2O2 at 80 min post-exertion was increased. NO2 − concentration showed a tendency to increase at 80 min post-exertion, with no variations in MDA and pH. No variations of NO2 − were found in plasma, while there was an increase of NO2 − at 80 min post-exertion in the relation between EBC and plasma. NO2 − in EBC did not correlate to plasmatic NO2 −, while it did correlate directly with H2O2 in EBC, suggesting a localized origin for the exercise-related NO2 − increase in EBC. MDA in plasma did not increase nor correlate with MDA in EBC. In conclusion, high-intensity exercise increases lung-originated pro-oxidants in non-athlete subjects with no evidence of early lipid peroxidation and changes in the pH value in EBC. We acknowledge Mr. Luis Pizarro Zúñiga for his technical assistance in sample collection and chemical analysis of the samples.